HP-FFF Analog and Low-cost models with exchangeable anvils suitable for fruit traders. HPE-II-FFF Digital model with exchangeable anvils suitable for medium budgets who require digital accuracy and data output, software offering the full flexibility and versatility. This version is most suitable for universities, as well as research centers. The technician should do two measurements at the opposite sides of each fruit, e.g., at the sun-side and the shadow-side. The point of measurement should be plain and without any fault on the peel. 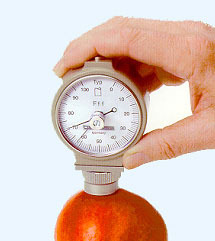 With this instrument, the user can see the yielding of the fruit under a certain and constant press power as well as a defined measuring distance. The indicated measured value is a quotient. For this reason, it is absolutely important that the user always note the anvil employed for the firmness test. The anvil does not penetrate the peel of the fruit. 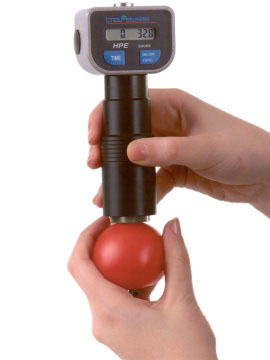 The mechanical Fruit Firmness Tester - FFF-Series is equipped with a trailing pointer. It serves for the determination of the highest measured value during the firmness test.